After leaving a big pile of vegetarian cookbooks on the hob before going out yesterday morning, I decided to consult none of them for dinner last night. Instead, I turned to an old friend who I’ve been neglecting recently, what with the dearth of ‘exotic’ recipes in the Perfect column thus far, Cooking with my Indian Mother-in-Law. I can hardly explain how much I love this book. Madhur is the goddess for special occasions (or Vivek Singh, if there’s a banquet on the cards, which there almost never is), but this is the bee’s knees for simple, everyday curries I promise you. It’s one of those books that I find myself evangelising about, I’m so desperate for everyone to own a copy. Anyway, I knew it would have something fit for an ever-so-slightly hungover Thursday after a humiliating lesson from the bike-repair man. And lo, it did, in the form of ful ghobi bateta ne mattar nu saak – or, for those of you who need help with your Hindi (? 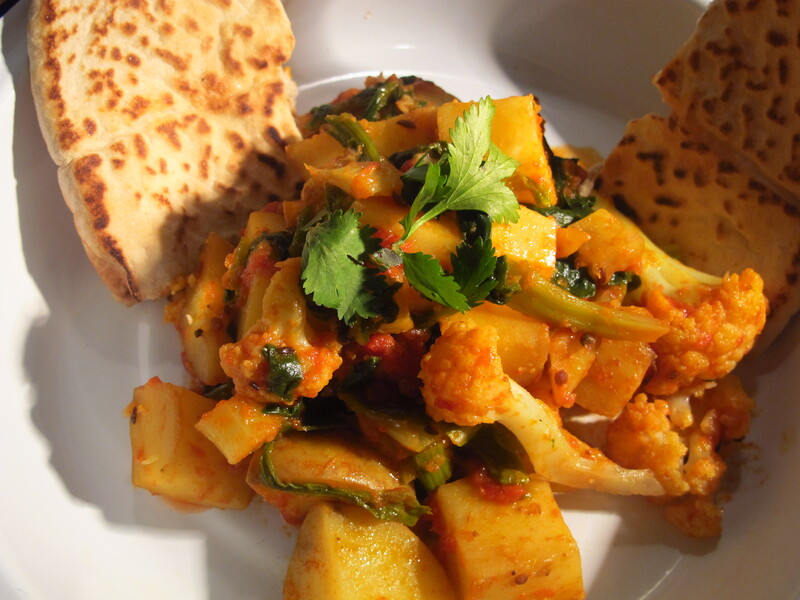 ), cauliflower, potato and pea curry. Except, as I chose to take the quiet route home past the Turkish supermarket rather than anywhere with freezers, in order to practice my braking techniques, it was a cauliflower, potato and spinach curry instead. Like any proper curry, it necessitated turning out the entire spice drawer (why do I still never think to get all my ingredients out first? ): mustard and cumin seeds, fenugreek, asfoetida (my flatmate had never smelt that before, so that was fun), chilli powder, turmeric and dana jiru, a mixture of roasted and ground coriander and cumin seeds, plus chopped tomatoes, a hefty hit of garlic and, of course, the vegetables. It only took half an hour to cook, and I was pretty pleased with the result – served with pitta, rather than chapattis (thanks to the Turkish supermarket), and topped with fresh coriander, it made a superb dinner, today’s lunch, and tomorrow I plan to stir the remainder into some scrambled eggs after a run.The spices were interesting, without overpowering the rather delicate vegetable flavours, which is why it always pays for me to follow a recipe when it comes to curries. Interesting footnote, at the bottom of the recipe, the Indian mother-in-law in question, Rose, claims that ‘to preserve the goodness, particularly the calcium, of the cauliflower, it is best washed before you cut it.’ Is this true, does anyone know?